Friary Mill Bakery donate a Giant Pasty! 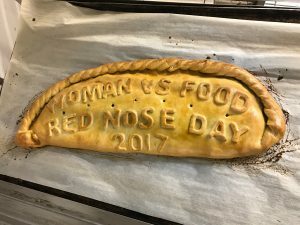 In aid of Red Nose Day 2017, a TK Max employee took on the challenge of eating our Giant Pasty. A whopping four times as big as our large steak pasty, the beast sure is not for the faint hearted. Tegan, the TK Max employee, stated “I was a bit overwhelmed when I first saw the pasty but I just had to give it my best shot because so many people had sponsored me to do it, I didn’t want to let them down.” Seeing how much ingredients went into the pasty, we can not say we are surprised to hear Tegan was overwhelmed by the size of it. The pasty took up a whole tray and measured 20 by 10 inches. We were very honoured to take part in such a fun, exciting charity fundraiser and would like to congratulate Tegan for almost finishing the whole thing! We guess we won’t be seeing her in any of our bakeries any time soon, but when (if…) she ever gets the craving for a pasty again, we’d love to meet her. A big congratulations to the shop itself for managing to raise £140 to Red Nose Day and thank you for getting us involved. Are you having a charity fundraising event that requires Friary Mill Bakery’s help? Do not hesitate to get in touch, we are passionate about giving back to our amazing community and opportunities like this do not go a miss.